This year's Montreal International Jazz Festival has begun. The tons of free concerts and activities are great for a family day out. The Flower Pot has not been idle. 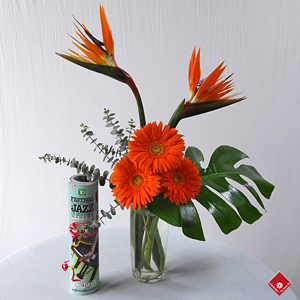 We've created a gorgeous and jazzy flower arrangement that will remind you of those smooth songs you enjoyed so much. We're including a Jazz fest program so you can stay on top of all the concerts you want to attend. Can you keep up with Montreal's summer nightlife? The game is on! Visit us, your friendly Montreal florist located in Griffintown at 1340 Notre Dame Ouest. We can help you choose a great gift over the phone too, 514-938-1234. Check out our online offerings for great personalized gifts and other special treats.